If Old Mother Hubbard had had a food storage program before she went to her cupboard her poor dog would have gotten his bone. Given the fact that her cupboard was bare it was probably because she didn’t have the wherewithal to fill it. Finding the resources to put food by against troubled times is a common problem, but it is solvable, even for those of us on tight budgets. In fact, over the long term, the food storage program you start now will save you money. It is like starting a savings account. You earn interest through greater savings in your grocery budget. Despite what many believe, you don’t have to spend large amounts of money on specially packaged foods to put away a sizable food store. You certainly can do this if you like, but what you’re doing is trading money (and a good deal of it) to save effort and time. Turn that equation around and you can save a lot of money if you’re willing to spend a bit more time and effort to get what you want. Depending on what you decide is important to you, everything you will need for a complete food storage program can be had from your local grocer and, perhaps, some other local businesses. Before buying anything you should sit down at the kitchen table with paper and pencil because you have some decision making to do. Ideally, everyone who’ll be depending on the food storage should be at the table as well, but the person who will be responsible for the program can do it alone, if necessary. Once you have your list, write next to each scenario the length of time you feel it might last. Chances are, the situations that will concern you most are weather related and some of the more common man-made disasters, but may also cover long term unemployment, severe economic depression, war or civil insurrection, or threats even more exotic (cometary impacts, anyone?). Now that you have a list of probable scenarios and the length of time you think each may last, you are ready to plot the course of your program. Plan your food purchases to meet the needs of the shortest duration scenarios on your list first. As you accomplish each goal set your sights on the next longest and work towards covering that one. In this way you are steadily preparing for one scenario after another while making progress towards your ultimate goal of meeting the needs of your longest lasting concerns. Right off the bat, I want to say where you should not get the money to pay for your food storage and that is by running up debt. This means that you should not put your food purchases on credit cards. The money lost to credit card interest rates is self-defeating in the long run and will just get you further into a problem rather than getting you out of it. If you are the type who can and does pay off their credit card purchases every month when the bill comes due, then using one might be a real convenience; otherwise it’s a temptation to be avoided. Fortunately, the financial outlay need not be so great that you must spend your children’s college fund or sacrifice your retirement account. With a little forethought and research it might be so little as to represent the family foregoing one restaurant meal a month or renting a video to watch at home rather than paying full admission to see a first run film at the theater. As a matter of fact, unless you are compelled by special circumstances to do otherwise, you are better off to not spend a lot of money at first. Like many other long term projects, there is a learning curve involved with building a good food storage program. Your initial purchases will most likely be small while you’re learning more about what you need to do. In this way you are less likely to make expensive mistakes that will have to be corrected later. Rice, flour, beans, milk, sugar, shortening, Tang, canned greens, carrots, pumpkin, and tuna will make for a pretty bland diet, but for only $40 and a month’s time it will give you a solid start on a good program. In the second month you can begin to expand the variety of foods in your program. The specific types and amounts of food I’ve listed are not meant as rigid rules, but as illustrations of what can be done. Your personal tastes and the circumstances of the scenarios you’ll be planning for are what should determine your specific purchases. It is important to only purchase those foods you are presently already eating or are willing to learn to eat starting as soon as you purchase it. Otherwise, there will be the temptation to leave it in its container and not use it. This is bad planning because it leads to failure to rotate the foods out in a timely fashion as they age or lose nutritional content and palatability. By not using the foods in your storage program you also do not get the experience of how to make them into tasty, attractive meals your family will want to eat. This will leave you at a severe disadvantage when the crunch comes and what’s in your larder is all you’re going to get. As I cover each purchase I’ll give some considerations you should think about such as: If you don’t foresee having a way to bake bread, then buying a lot of flour might not make much sense, but you might make flat breads instead or learn to do your baking in a Dutch oven. If some of your short term plans call for removing to another location on short notice, then the food for that part of your planning needs to be of a type that can be eaten with little preparation or cooking being required. If safe water will be in short supply, then foods that require a lot of it to prepare them might not be a good idea. The foods that I have chosen all have excellent storage characteristics for the short to medium term, up to about two years. Detailed information and instructions on storing foods may be found in my Prudent Food Storage FAQ. If you have Internet access you may download a copy free from the Providence Cooperative web site at http://www.providenceco-op.com or from one of the host sites that also carry it. Many of them may be found by searching on the term “prudent food storage” using most any search engine. Your first $10 storage food purchase buys 10 pounds of rice, 2 pounds of beans, a jar of Tang, and 5 pounds of vegetable shortening. The 17 cents change is carried over into the next week. This amount of rice and beans gives a ratio of 5:1, a perfectly acceptable essential amino acid balance (commonly called “making a complete protein”) for most healthy adults. An extra $3.45 expenditure will double the amount of rice and another $3.49 will buy five times the amount of beans. Purchasing the rice and beans first means you have food that can be made edible with no other foods having to be added to them and needing no preparation other than boiling. If cooking fuel is short, split peas, lentils, and black eyed peas cook quickly. Pre-soaking and/or pressure cooking is even more economical. The Tang orange drink provides 100% of the US RDA vitamin C requirement in every 8 oz. glass (6 qts. = 24 8-ounce glasses), lesser amounts of other important nutrients such as vitamin A as well as some sweet taste since we have not yet bought anything else with sugar in it. Vitamins A, C, and D are the major nutrients typically lacking in most storage foods. Don’t assume that any drink mix or canned juice has vitamin C in it. Read the nutritional facts label on the side closely to see what the manufacturer claims it contains. An appalling number of juice products, even some canned citrus juices, claim no vitamin C content at all. The last purchase is the can of vegetable shortening. Fat is actually a necessary nutritional component even if we do tend to eat too much of it in the present day U.S. The shortening allows you to make foods such as biscuits, fry breads, refried beans, pancakes, fried rice and pan breads, and contributes flavor. In a survival diet, fat is an important source of vital calories. This is an important consideration for small children, pregnant women, the elderly, and the ill who might otherwise have trouble eating enough bulky beans, rice, etc., to gain sufficient calories to stave off weight loss and possible malnutrition. Your second $10 nets you 20 pounds of all purpose white flour, 5 pounds of granulated white sugar, 3 cans of carrots, and 3 cans of spinach. The 24 cents left over is carried over into the next week. You now can make bread to give some variety to your rice and bean diet. If you don’t have any store-bought yeast to raise your bread, you can do what your pioneer forebearers did and learn to make “sourdoughs” to leaven it. If you have a grain mill or can acquire one then you may be able to find a local source of whole grains at a reasonable price to supplement or replace the white flour. The sugar allows you to make sweet breads, puddings from the flour or rice, adds calories, and greatly contributes to taste. Of all the canned vegetables to be had from the grocer the dark green and the orange vegetables give the most nutritional value for the money. Canned greens such as turnip, mustard, collards, spinach, and kale range in value from 50-110% of the RDA of the important nutrient vitamin A (in the form of carotene) per half-cup serving. Many of them also include a fair amount of calcium and vitamin C as well. The carrots have 100% RDA of Vitamin A per half-cup. The third ten spot buys you the 64 oz. box of dry milk. The slim remaining penny is carried over into the next week. Sixty-four ounces of non-fat dry milk will make 20 quarts of skim milk to provide essential amino acids, necessary calcium, along with vitamin D (30% of the RDA of calcium and 25% of vitamin D per 8 oz. glass of reconstituted milk). Unlike fresh liquid milk, the dry powder is shelf stable and can be stored for long periods of time. It may be drunk as straight milk or used to enhance dishes made from the ingredients purchased in the other weeks. Dry milk can also be used to make excellent yogurt and even non-fat cheese. Your last purchase of the first month’s cycle brings in 10 cans of tuna, 2 cans of pumpkin, and 5 cans of turnip, mustard, kale or collard greens. The remaining 32 cents is added to the surplus from the prior weeks, now totaling 74 cents. Although the grain, beans, and milk provide all necessary amino acids, most of us will rebel at a purely vegetarian diet, so at least a little meat three or four days out of a week can go a long way towards making matters tolerable. Other canned meats can be substituted, but as a general rule tuna is leanest and cheapest per ounce. Beware of paying canned meat prices for fillers like pasta, rice, or potatoes. They can be added much more cheaply after the fact rather than buying them already in the can with the meat. The pumpkin (plain solid pack, not pie filling) can be used like any winter squash, carrots, or sweet potatoes and carries a tremendous amount of vitamin A in the form of carotene (300% of the RDA per half-cup). A friend of mine has developed a pumpkin biscuit that I’ve grown quite fond of. It makes a good baked dish and is very versatile in casseroles, soufflés, puddings, and as either a sweet or savory vegetable. There’s more to pumpkin than pies. The 74 cents left over seems trivial but it will buy 2 1-pound cartons of iodized table salt, or yeast to make bread with, or baking soda for leavening and other uses, or a small can of pepper to season food. You can also hold it over to combine into the next month’s surplus. The purchasing cycle could be repeated month to month until you reach the amounts you desire, or varied to broaden the selection in your cupboard. If you can afford to use the economies of scale that making larger bulk purchases gives you, then the price per pound of the foods you buy will drop considerably. By taking advantage of sales, bulk food outlets, warehouse groceries such as Sam’s Club and Costco, local restaurant and institutional food suppliers, or ethnic grocers (Asian, Hispanic, etc.) you will do considerably better than what I’ve outlined above. If you have the time and resources available to you, much of the fruit and vegetable portion of your storage program can be economically acquired by growing it yourself. Not only do you get wholesome food, but by putting it up yourself you get exactly what you want in the way that you want it. If being frugal is of paramount importance though, growing your own will need some careful analysis to be certain you’re not spending more in time, labor, and equipment than the value of the food will make up for. This is especially true when it comes to food preservation, but you can at least partially offset this by choosing appropriate preservation methods. Pressure canning requires quite a bit of expensive startup equipment (canner, jars, lids, rings, etc.) which may make the operation uneconomical. However, if you dry the food instead you can often do this at a much lower cost. One area of home preservation that generally will be worthwhile to do yourself is canned meats. Beef, pork, and chicken often go on sale and can be had for quite reasonable prices, so even with the price of the jars and equipment necessary to process it, home canned meat will usually be cheaper per pound than any commercially canned meat of equivalent quality. 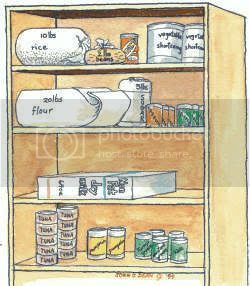 There are two cardinal rules of successful food storage: The first is store what you eat and eat what you store. The second is to rotate, Rotate, ROTATE! Follow them always, keep a watchful eye on your local grocer’s offerings, and be willing to make a moderate investment of time and effort. Do this and you’ll have a successful food storage program that your family will look forward to eating in good times or bad without sacrificing your financial well being to get it.